Everyday in this nation, tens of thousands of Americans without health insurance enter hospital emergency rooms seeking medical care for everything from the common cold to heart disease. Unless you are an unfeeling monster of some kind, most Americans concur that no one in need of emergency medical care should be denied it because they lack insurance. Well then, who covers the cost of the uninsured? Responsible Americans who have medical insurance pay for the uninsured through their premiums and co-pays. That is why the United States of America has ‘the’ most expensive health care system on Earth; because we have yet to come up with a reasonable, fair system for making sure that the health-care needs of the nation are shared by all Americans. Does that require ‘responsible legislation’ or an evil-autocratic socialist government? The Affordable Health Care Act sought to rectify these problems by requiring all Americans to have some kind of health insurance. Those people who cannot afford health insurance and/or who are unemployed, are eligible for exemption from the mandate and are provided with health care coverage. Ironically, it was the conservative Heritage Foundation that years ago drew the parallel between drivers having to have auto insurance and the necessity of requiring every American to assume some responsibility for health insurance. But the politics of ‘destroy your enemy’ have probably had more to do with all the passionate disapproval that Republicans and conservatives have expressed for the Affordable Health Care Act than the desire to find reasonable solutions. In the same spirit that has motivated Kentucky House Minority Leader Mitch McConnell to time and again exclaim that his primary objective was to insure that President Obama is not elected to a second term, many on the political right have joined the battle against health care reform simply because it was proposed by Barack Obama. Really? There’s no difference between buying health care and broccoli? So, heaven forbid, Justice Scalia should wake up one night in the throes of a heart attack or a stroke, it won’t make any difference if Mrs. Scalia calls 911 or her local supermarket? 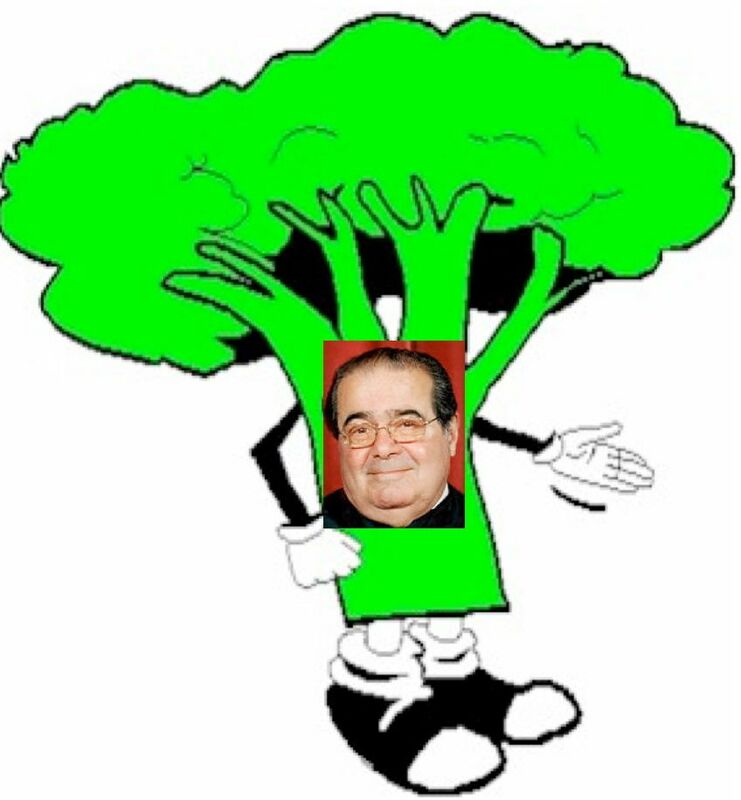 Dear Justice Scalia, regardless of what you might think of my politics, my faith or sexual orientation, I’m not a vegetable and I don’t believe that the health care crisis in the U.S. can be turned into yet another one of those simplistic analogies that are so popular with reactionary conservatives. But thank you for reminding us once again that you and people who share your belief that documents like the Bible and the Constitution can and should only be understood in the context of the times in which they were written are actually the cause of the problem and are incapable of making meaningful contributions to solving complex problems.